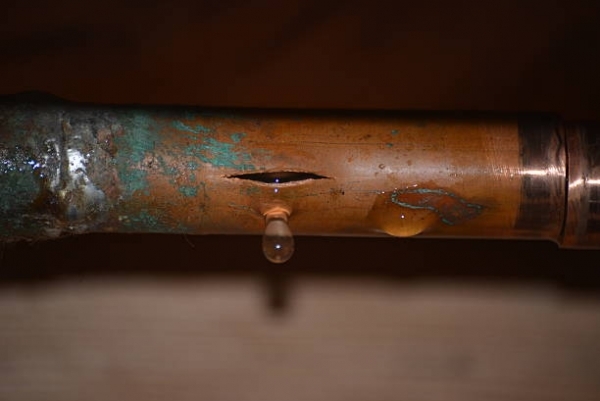 Burst or leaking pipes can occur year round. While freezing weather is a more common reason, rust or poor installation can also cause issues. Acting quickly in the event of a burst or leaky pipe is very important to prevent the growth and spread of mold. Turn off or stop the water flow and call a professional water remediation company, like Trilink Restoration Services, 24 hours a day, 7 days a week. Here are some signs to watch out for that could indicate that a pipe has burst, or could be leaking. If there is a break, air can get into the pipe and cause a bubbling or gurgling type noise when running faucets or flushing toilets. If you hear a noise like this while water is supposed to be flowing, it would be a good idea to check for other symptoms of a leak, and be aware that you might have a problem. Toilets, sinks, drains, or faucets might emit the smell of sewage throughout the room indicating a break in the water line. When a water line that runs inside a wall breaks, water stains on the wall or wallpaper can appear. The same is true for the ceiling. Puddles of water can accumulate around the base of the toilet, faucets, sinks, laundry machine, etc. Anywhere water is accumulating is a symptom of a potential break or leak in the pipe. A not so obvious sign to check for is in your front yard. Soggy areas could indicate leaking water underground, and can even lead to a sink hole which can be very dangerous to children or small animals. It’s not always about water appearing…sometimes water doesn’t appear when it should. If a valve is turned on for a faucet, laundry machine, dishwater, toilet, or something else and you have no or low water pressure, you’ll want to check other appliances to see if you can narrow down which one is the source of the issue. And consult a professional if you think there is a problem.